“In our county there are so few dairy farm families left so everyone takes a town festival or parade and gets the cheese to give away. We have been in charge of the BBQ Days parade float the last few years,” Steinhagen said. This additional promotion of dairy and hard work on their farm are reasons for the Steinhagens to be named the 2018 Scott County Farm Family of the Year. 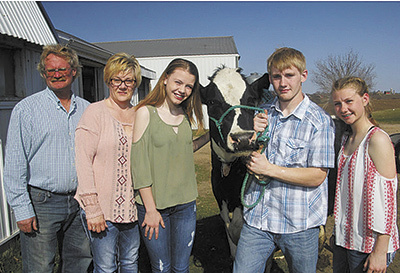 Gary, along with his wife, Lori, and their children, David, 18, Greta, 16, and Martha, 14, milk 115 cows on their dairy near Belle Plaine, Minn.
“We do a lot of stuff off the farm and volunteer work. It’s nice to be recognized,” Steinhagen said. Steinhagen does the majority of the day-to-day work with the help of one part-time employee for milking. Lori helps when not at her off-farm job. The kids also do chores when not participating in several school sports or 4-H and FFA events. They also each have their own project areas outside of dairy – David has Dorset sheep, Greta has Boer goats and Martha has La Mancha goats. In addition to helping promote dairy in parades, the Steinhagens invite people to their farm for tours and have previously hosted the Scott County City to Country tour. However, learning the agricultural life has not been passed down from family. Steinhagen grew up in town in Waconia, Minn.
“Since I could walk I wanted to be a farmer, and I don’t really even know why. I had cows in the sandbox. I’ve never wanted to do anything else,” he said. While in high school, Steinhagen sought employment on a farm and learned the ropes of the career by working on a local dairy. 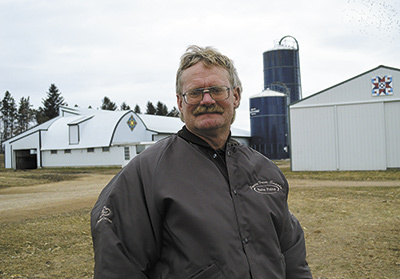 Two years after high school graduation, Steinhagen bought a herd of cows and started renting a farm to begin his dairying journey in 1984. The transition proved to be a big learning curve for the city-turned-farm boy. “I knew how to manage cows, but I didn’t know how to manage money or any of that. The money management and business management is the hardest thing to learn,” Steinhagen said. He would rent two other farms before finding and buying his own – his current farm with 200 acres of land – in 1997. “It was a relief,” Steinhagen said about buying his own farm. Although the barn had not housed cows for 20 years, Steinhagen worked to get the facility into working condition. 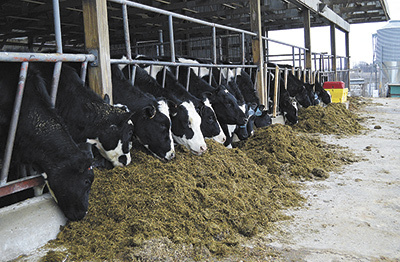 He converted a heifer building into 65 free stalls and used double-3 side opener Surge parlor until the next year when he was able to retrofit a 17-unit parabone parlor. He still uses the milking facility, which has the ability to milk eight cows on one side and nine cows on the other. In 1999, the same year he got married, Steinhagen put up a building for hay storage. In 2001, he added a monoslope heifer building to his farm. In February 2008, Steinhagen’s barn collapsed under the weight of the snow. The heated shop is the most recent addition to Steinhagen’s farm. Over the years, the biggest challenge of dairy farming has been the years of low milk price. Having fieldwork custom done is one way Steinhagen cuts cost to try to stay profitable. The Steinhagens also try to be frugal about their purchases. Even with the current downturn in the industry, Steinhagen tries to stay focused on his end goal. “I have a lot invested in my building. I want a return on them. Ten years isn’t much of a return. I want 20 years out of my buildings,” he said. Plus, he likes the independence of dairy farming – being able to set his own schedule and do things when he wants. But one of the best things about dairy farming for Steinhagen is having his family involved, whether helping with chores or promoting in parades. The five are already planning for Belle Plaine’s float this year.